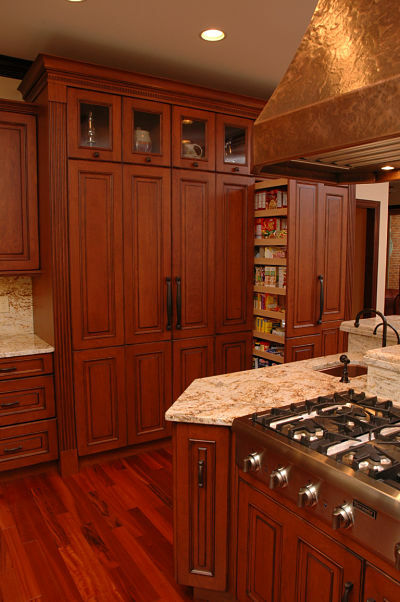 One of the main objectives of a kitchen remodeling project is to create functional storage. 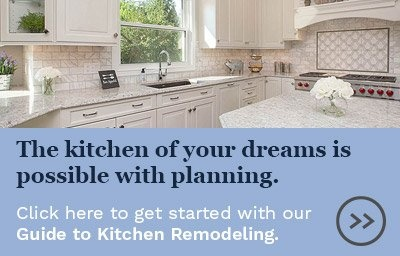 A kitchen pantry cabinet is often high on the list of essentials when homeowners remodel their kitchen. 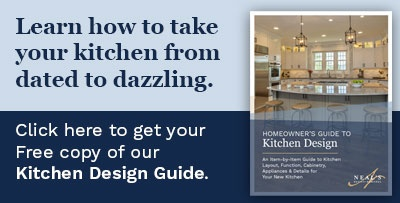 There are many design options for pantry cabinets. You can use shelving designed expressly for contents, inserts to help optimize storage capacity, pullouts for easy access, or open shelves. The advantage of a pantry cabinet is that it is a place to organize items that you want to have at hand and keep them out of sight. When planning pantry storage it helps to make a list of the items you plan to store and take a few measurements to determine the depth, height and number of shelves you will need. A depth of 14 inches will hold most small appliances. Shelves in this kitchen pantry were configured for storage of small appliances, snacks, wraps, baking and cooking supplies, and baskets that contain small items. Pullout shelves are great for kitchen pantry storage. Some shelves are framed with wood or metal edging to keep contents in place. They can be installed at varying heights to hold both small and tall items. Items stored can be easily viewed and retrieved. Pullout kitchen pantry shelves simplify organization. Wood framing on these shelves helps to keep contents in place. A chef’s pantry has multiple shelving units that swing out and inserts that help to keep contents organized. There are wood framed units and frameless units with adjustable metal wire shelves. 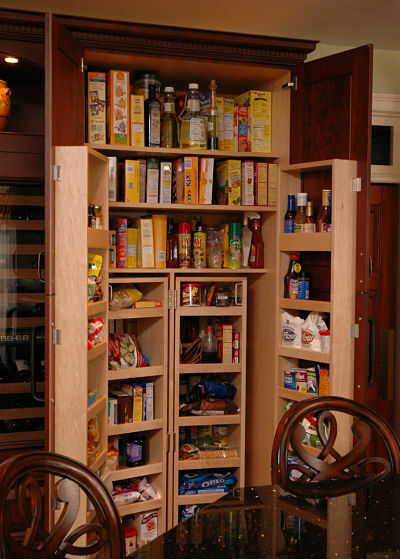 A multi-shelf chef’s pantry with a deep cupboard placed above for storing larger items such as boxed cereal. A butler’s pantry is a “serving pantry,” a place where china, serving ware, linens, snacks or dry goods can be stored. Features that distinguish a butler’s pantry are upper and lower cabinets and a strip of counter surface. In older homes, a butler’s pantry was located in a hallway between a kitchen and dining room since the contents stored were used for entertaining. This butler’s pantry has cupboard storage, drawers, a granite counter for placing items and base cabinets with pullout shelves for easy access. One of the easiest ways to organize boxed, canned and bottled food is a pullout pantry unit. There are no hinges or door swings to contend with. Shelves can be adjusted according to the height you may need for items. Pull the unit out and contents are easy to find. The contents of this pullout pantry can be viewed at a glance and are readily accessible. 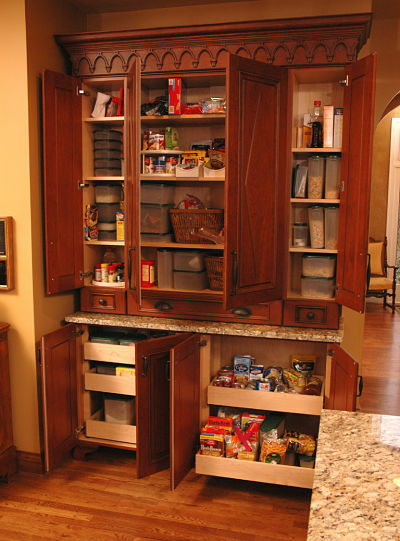 If space in limited, pantry storage can be created by using narrow cabinets installed on the side of a cupboard or base cabinet. 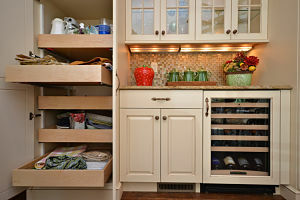 Five or six inches in depth will allow you to store kitchen essentials such as spices, seasonings, oils and vinegars. 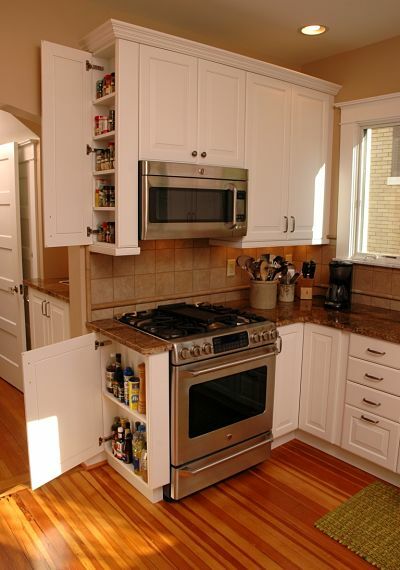 Six-inch deep kitchen cabinets can provide ample storage for many small items. 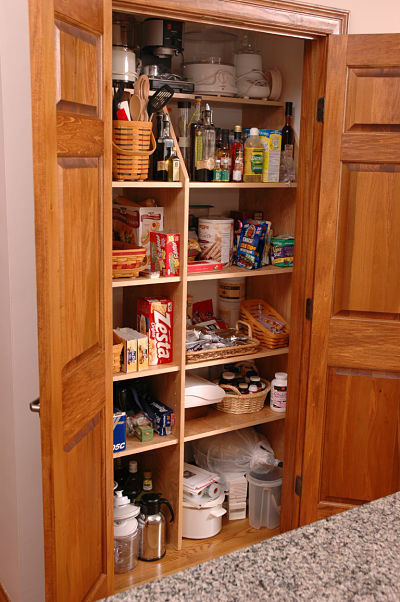 A pantry located near a kitchen can be converted to pantry storage by fitting it with shelves for storage. Broom closets can be refitted too, to optimize storage space. 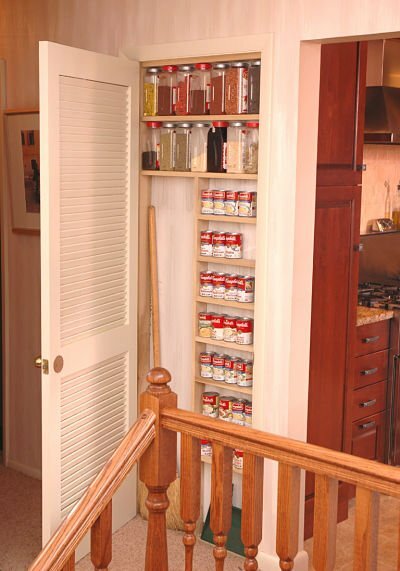 A narrow closet in a hallway was fitted with shelves to provide storage space for dry spices, soups and a broom and dustpan. The closet is located just outside the kitchen but is readily accessible. 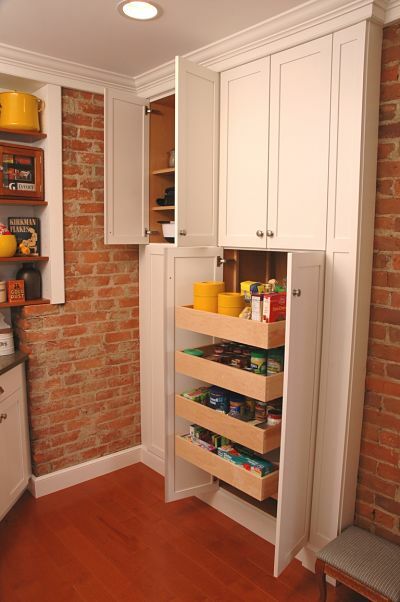 Pantry storage doesn’t always have to be hidden behind a door for items that you may want to have at hand. Dishes and glassware can make an attractive display and can be located conveniently for frequent use. Lighting can be installed to illuminate contents. 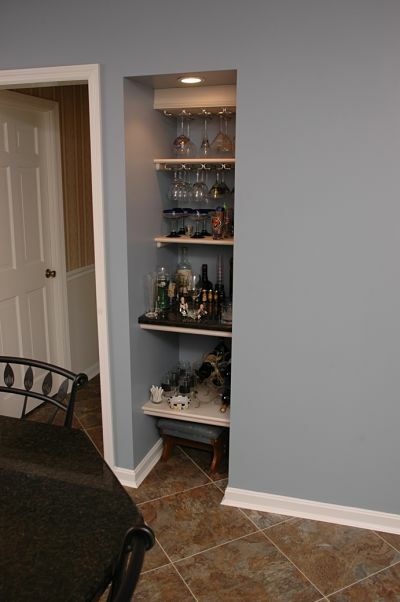 Open storage was created by removing the door of a closet and adding shelving for glassware and spirits. Slats were installed to store stemware and there is space for a step stool below to help the homeowners access contents on the higher shelves.